Series Mission archeologique de Ras Shamra (Series) ; 1. Acknowledgement Digitized by the Schoenberg Center for Electronic Text and Image at the University of Pennsylvania for the AMAR Collection. The Plain of Antioch in North Syria, called by the natives the Amuq, was once the site of the "Syro-Hittite" kingdom of Hattina, and there is evidence that its occupation goes back certainly to Chalcolithic times if not before. The floor of the plain is covered with mounds, most of which are now known to have preclassical remains. Early in the fall of 1933 the Expedition staff realized the value of an archeological survey which would take the form of an inventory of all the mounds in the Plain of Antioch and its tributary river valleys. The purpose of an archeological survey of this type is the complete reconnaissance of a certain area to discover what, if anything, within that area is of archeological interest. It was not until the spring of 1936 that such a survey was carried out. The emphasis of this survey is admittedly preclassical; no attempt was made to investigate sites which were not in the form of the characteristic mound. The survey was accomplished in three weeks, but in the case of several mounds the material collected at that time was amplified by sherds picked up in previous years by the various members of the Expedition. 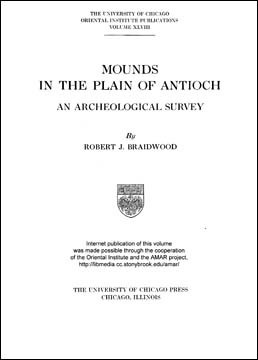 In this volume are presented the names of all the mounds in the Plain of Antioch, with their positions fixed on maps, as well as indications of the various cultural periods during which they were occupied and of the distribution of remains of each period. For a complete and up to date list of all of the ca. two hundred and seventy volumes of Oriental Institute publications available online see AWOL - The Ancient World Online - 2: The Oriental Institute Electronic Publications Initiative. The LCTL project is happy to announce that the LCTL database of Less Commonly Taught Languages course offerings in North America has been upgraded to a new more reliable server and a new platform. We are happy to continue maintaining the database, which has been a part of CARLA since 1993 (remember Gopher?). Not only have we made technical upgrades, we now have more fields that people can search on when they want to locate courses. In addition to the standard searchable items (language, state, institution, k-12, summer, post-secondary), we have added more search options: click on ‘advanced options’ and a larger page opens, From here, you can search for levels offered, availability, emphasis or focus of the course, degrees offered by the relevant department, whether there is a tightly integrated study abroad component, if the institution is part of a consortium like CIC, The U of California consortium, the Five Colleges in Massachusetts. Fields now have expanded ‘help’ explanations. The value of this database certainly depends on its completeness and accuracy. You are urged to look at the courses you know about or are involved in, and submit updates, corrections or deletions. The top of every page which gives details about a course, offers a link to the correction page and an option to check if the course no longer is being offered. After you submit new details, you will receive an email confirmation. As soon as the project verifies the submission, we will add it to the available records. I hope you contact me with comments, questions or suggestions. The SOAP Project (*), funded by the European Commission, would like to announce the release of an online survey to assess researchers' experiences with open access publishing. This survey aims to inform the most comprehensive analysis of attitudes to open access publishing to date and is seeking views from a wide a range of interested parties. It is primarily aimed at active researchers in public and private organizations, from all research fields in science and the humanities and focuses on publication of research articles in (open access) peer-reviewed journals. If you would like to contribute to shaping the public discourse on open access, please visit http://surveymonkey.com/soap_survey_d. It should take 10-15 minutes to complete. We would appreciate if you would share this link with your colleagues and collaborators so that the views of your discipline are properly represented. libraries (the Max Planck Digital Library of the Max Planck Society). The project runs for two years, from March 2009 to February 2011. Through at least three thousand years of development, from local shrine in a regional town to national center of power, the temple of Amun-Ra at Karnak has known dramatic modifications tied in with political shifts, religious reform and ritual changes. As a legacy of a culture where every aspect of life was permeated with religion, the study of this temple complex touches upon every factor of human existence in ancient Egypt. Karnak therefore presents an excellent entry for understanding more about all aspects of ancient Egyptian culture and the study of its legacy. The Digital Karnak Project aims to make the site of Karnak more accessible to students and instructors in the English-speaking world. The features of this website have been designed to provide college classrooms (and the interested public) with easily accessible, up-to-date, expert material relating to the temple precinct. As part of this goal, a 3-D Virtual Reality model of the temple was constructed, offering students a completely new way to view the temple: reign-by-reign, following the complex patterns of royal construction, modification and destruction that are now obscured by the latest building phases at the site. Footage of this model, as well as original videos and maps, are accompanied by thematic essays written and reviewed by Egyptologists to supply students and instructors with reliable information in a digital and visually dynamic platform. A simplified version of the Virtual Reality model of the temple is also made available in Google Earth, for a completely interactive experience. The Digital Karnak Project combines the experience and talent of two sections of the University of California at Los Angeles (UCLA): the Experiential Technologies Center (ETC) and the UCLA Encyclopedia of Egyptology (UEE). Directed by Dr. Diane Favro through the School of the Arts and Architecture with support from UCLA’s Academic Technology Services, the ETC uses powerful information technology tools to support creative and cross-disciplinary research in archaeology, architecture, humanities, social sciences, and the performing arts. Dr. Willeke Wendrich of the Department of Near Eastern Languages and Cultures is director of the UCLA Digital Humanities Incubator Group (UDHIG) and the editor-in-chief of the online UCLA Encyclopedia of Egyptology (UEE), a repository for scholarly content related to Egypt. 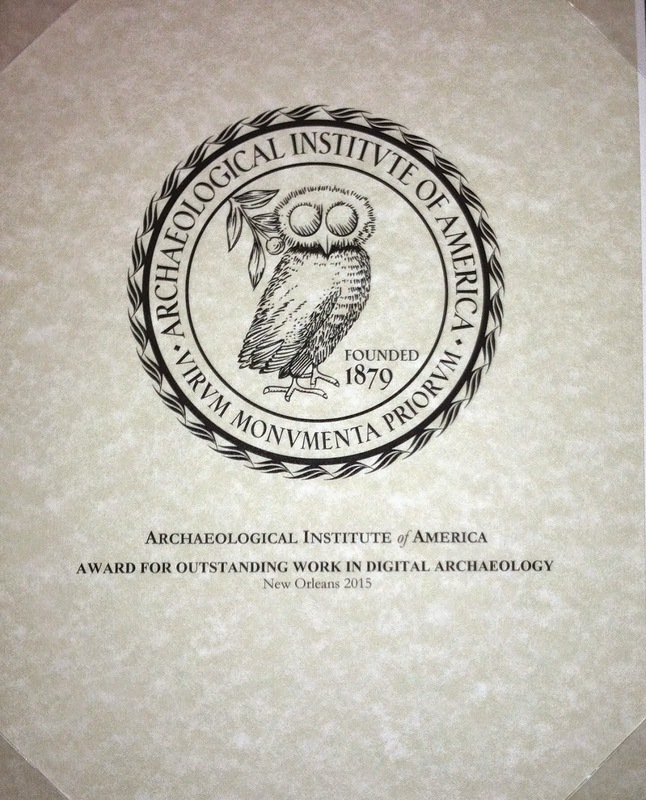 The Digital Karnak Project was funded in part with a grant from the National Endowment of the Humanities (NEH). Financial assistance was also provided by the Steinmetz Family Trust. Staff assistance and computing infrastructure was provided by UCLA's Institute for Digital Research and Education (IDRE) and UCLA's Academic Technology Services (ATS). From 1997 to 2003 the Cultural Virtual Reality Laboratory (CVRLab) created a digital model of the Roman Forum as it appeared in late antiquity. The notional date of the model is June 21, 400 A.D. The purpose of the modeling project was to spatialize information and theories about how the Forum looked at this moment in time, which was more or less the height of its development as Rome's civic and cultural center. The digital model includes over twenty features (buildings and major monuments) filling up the western zone of the Roman Forum from the Temple of Vesta and Temple of Antoninus and Faustina on the east to the Tabularium facing the western slope of the Capitoline Hill. Thanks to archaeological campaigns that started in the early nineteenth century and which continue to the present day, these features can be seen in Rome today and constitute one of the city's most important archaeological sites. Their state of preservation varies from fair to poor; and the ruins seen today represent a mixture of different phases in the life of the Forum. As a result, understanding the Forum is a challenging task not only for tourists but also for scholars. Almost as soon as the new excavations started bringing the ancient remains to light, archaeologists such as Canina, Huelsen, Gatteschi, and Gismondi started to create graphic and physical reconstructions of how the Forum might have looked at specific moments in time. The CVRLab digital model, created with the help of an international Scientific Advisory Committee, is the latest example of this perennial project. From the time the modeling project was conceived, the investigators intended to present their results to students, scholars and the general public. The digital model of the Forum can be viewed on various hardware and software platforms. These range from simple static views that can be displayed on a computer monitor to dedicated visualization theaters costs hundreds of thousands of dollars or more. With generous support from the National Science Foundation, the CVRLab was able to create this Web site about the digital Forum model from 2002 to 2005. The purposes of this site are: (1) to use the Internet to permit free use and easy viewing of the digital model by people all over the world; (2) to provide documentation for the archaeological evidence and theories utilized to create the model; and (3) to offer basic information about the individual features comprising the digital model so that their history and cultural context can be readily understood. wo auf der rechten Seite die Projekte des Instituts anklickbar sind. And see Open Access Archives: Griffith Institute. This project aims to digitise the 860 doctoral theses sourced from UK HEIs identified by the JISC funded ‘Review of User Requirements for Digitised Resources in Islamic Studies’. The project will also run an initial feasibility study to test whether the 860 identified thesis are available for digitisation, and if not, how the allocation may be delivered from other related theses. The project will use The British Library digitisation suite and experience to digitise the identified PhD theses on a cost recovery basis and to make them available via EThOS and the proposed National Gateway to islamic Resources. This project is now complete and 971 Ph.D. Islamic Studies theses are now available. These volumes are also available for sale in hard copy. In the past couple of days, additional volumes of Göttinger Miszellen have come on line. Volumes (1972) - 219 (2008) are currently accessible to subscribers to Digizeitschften. Other ancient content in this aggregation is here. If you'd like to have access to these and the rest of the Digizeitschriften collection, bring it to the attention of your librarians. Follow the links below to search the SCA Proceedings for articles by volume, region, author, or topic of interest. Newsletter of the Gennadius Library. Gennadeion News is published by the ASCSA Development Office and sent free of charge to friends of the Gennadius Library approximately twice a year. Past issues are available to download as PDFs. The current issue of of Gennadeion News is the Spring 2012 Edition. The List of Open Access Journals in Ancient Studies contains 648 titles (49 titles added since 15 February, 2010) and remains the most popular page in AWOL. appears at the bottom of all new and revised pages). I am seeking your assistance in particular in identifying scholarship on the ancient world which is appearing unembargoed in institutional repositories. Please direct me to your own or other useful collections and I will add them to the AWOL page Ancient World in Open Access Institutional Repositories. Administrative notes with user statistics have been posted in March 2012, November 2011, October 2011, July 2011, April 2011, January 2011, December 2010, October 2010, August 2010, July 2010, May 2010, and January 2010.